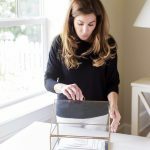 Now that January is over the real challenge is how to stay organized throughout the year. 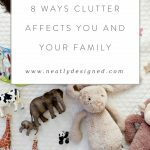 Old habits can resurface quickly so it’s important to look at some of the clutter triggers and how to avoid them. These are some tips to prevent becoming overwhelmed and living a simple, clutter-free life. If you don’t need it, use it, love it or have a place to store it, let it go If you start to understand this concept it will prevent unwanted clutter in your home. It’s basically retraining your thoughts when it comes to the stuff you own. Keep a calendar So many people have returned to paper just for the ease of it. It doesn’t matter if it’s a digital calendar or paper just make sure it works for you. Inbox for mail and papers Do you have papers that need to be signed for school? Bills that have to be paid? Setting up a system for incoming mail and important papers will keep you organized throughout the year. Keep counters clean Keeping your countertops free of clutter is a major step to an organized life. Once the piles start forming it can become overwhelming so make a commitment to clutter-free counters. Keep up with the laundry Speaking of overwhelming laundry is another area in the home that can quickly become a problem. Make laundry less of a chore by having an organized laundry area and staying on top of the laundry. Consider the garage part of your home When you sell your home do you include the garage in the sale? Absolutely! Garages should not become storage units but rather an extension of the home. Purge regularly so you can store items that belong in a garage and have a place to actually park your car. Paperless receipts Choosing to have your receipt emailed while shopping will save you from the bottomless pit of receipts that tend to get out of control especially as the year progresses. Set up files on your computer and you will not only be eliminating paper clutter but you will save time when looking for a receipt. Shred old papers Owning a shredder is one of the best ways to stay on top of paper clutter. Shred unwanted mail and outdated paperwork on a regular basis. Desktop File Keep a desktop file system for important papers you need on a daily basis. It will not only keep you organized but save you time. 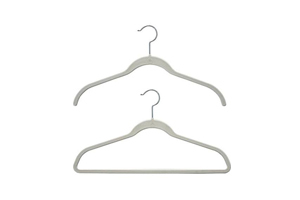 Change Your Hangers If you want to keep the neat an organized closet you achieved in January stay on top of the mismatched hangers from entering your closet. By the way, it’s not too late to make this simple change it is inexpensive and will give you immediate results. Stay away from Big Box stores Unless you have a large family big box stores can become a problem for many people who don’t have the place to store what they buy in bulk. Buy what you need and have the room for and you will be surprised how little effort it takes to stay organized. Label your containers Containers are a great way to sort and organize items but if they are not labeled people forget what is in them and buy more of what they already own. 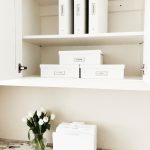 Purge, sort, contain and label a simple system to stay organized. Purge kitchen gadgets Throughout the year take inventory of the small appliances and gadgets you don’t use and free up space in the kitchen for what you love. Have a place for everything If there is a place for everything you own it solves the problem of overstuffed drawers, cabinets, and closets. It will also motivate you and your family to keep it that way throughout the year. If you take it out put it back The easiest way to stop clutter from forming is to get in the habit of putting back an item after you use it. A small step but makes a big difference in staying organized. Schedule a regular donation pickup One way to prevent clutter from forming is scheduling a donation pickup at least once a month. Keep an ongoing bag for items you no longer need or want and when its full consign or donate. Involve your children If you want to keep your home organized involve your children in the process. Give incentives to pick up toys and make the storage containers easy for smaller hands. Do not buy something just because it’s on sale When I ask clients how they accumulated multiples of items the answer is often because it was on sale. Even if something is on sale if you don’t need it or have room to store it, don’t buy it! Purge often I know I already mentioned this but it’s worth repeating. The more you purge on a regular basis the less chance there is for clutter to form. If you need help getting or staying organized hire a professional If you feel yourself starting to become overwhelmed reach out to a professional organizer who can help you get back on track. Many clients need a bit of a refresh throughout the year to keep their home running smoothly. Are You Ready To Simplify in 2019? Is it Sentimental Clutter or just Clutter?